However, let’s first explain what sound drivers are and what these Drivers do. What are Audio and Sound Drivers? Computer hardware and operating systems do not speak the same language. To communicate, they need a mediator- and this job is done by Drivers. A Sound Driver or an Audio Driver is a software program that helps your operating system communicate with your sound card. Issues with your Audio and Sound Drivers may prevent your Windows Operating System from communicating with your sound card. As a result, your Windows PC may fail to produce any audio and you will therefore have sounds problems or no sound on your Windows 7 PC. In addition, you may receive an error message on your screen relating to the sound problems. What can I do to fix Audio and Sound Driver problems? Windows computers come with a built-in utility called Device Manager which allows you to uninstall, install, and update Device Drivers. Most Audio and Sound Driver problems occur due to corrupt Device Driver files. You can fix such errors by uninstalling and reinstalling the problem Device Driver. The easiest and best way to permanently resolve Audio and Sound Driver problems is to allow a Driver Update Tool such as DriverDownloader to run a scan on your computer. DriverDownloader will quickly scan your computer, identify all the installed hardware, and then update the Device Drivers for the installed hardware (such as speakers, microsphone and other sound devices). A good driver management tool helps you save time and money. More importantly, it can prevent you from using an incompatible Device Driver that can cause more problems on your computer. You do not need to be tech-savvy to be able to use a driver management tool. With a reliable and efficient driver management tool such as DriverDownloader, all you ever need to do to fix audio and sound driver problems is to click the SCAN button in your software’s user interface. DriverDownloader will take care of the rest. Thank you very much my pc has sound now, you are the best site ever. i need for sound driver for win7 please. It’s crazy to me that windows 7 still has so many of the same problems Vista did. i am having ibm processor QQ8175 A50 THINKTANK 50 presently loaded with WINDOWS7 op. system.audio system is not working. please suggest the drivers. Iam trying to update software & drivers.Thank’s. after installing windows 7 my sound is not coming out,so please help me to fix this problem. i have downloaded realtek hd audio driver and installed but still it shows no audio device installed. please help me. Hello,i upgrade from xp(where i had NO SOUND PROBLEMS on my onboard realtek sound card)to windows 7 ultimate(here my sound is distortioned/crackling)!I try disable all enhancements,the default format to 44100hz,disable some levels into realtek hd audio manager with no result!Please help me,with the same latest audio driver i had no problem in windows xp! after changing my windows 7to windows 7 ultimate graphics card was not working …if i make it install in my pc it was not installig in my pc..pls fix it.. I have CRT monitor and I have NVidia Graphics Card(630 1-GB), when I connect monitor plug into Graphic Card on start the computer normally but Monitor doesn’t show anything on the screen. The screen remain black and windows 8 start it produces sound on which normally produces, but the screen remain black. ihave downloaded realtek hd audio driver through softonic downloader.While installing,the accept botton of the license agreement does not working. i have tried the tab+enter key. it still does not working.my pc is compaq b940 with windows 8.
i have dell with win 7 ,32 bit,how sould i get win graphics driver and install. After I installed a driver for my VGA, when I restart the computer (windows 7 64bit), I get a blue screen and I receive an error message about my device driver that I installed and that I must reboot my PC and uninstall my driver. But if I start the PC in Safe Mode, I can get to the windows and see my files. However, in Device Manager, in Display Adapters, I can see an attention yellow mark next to my Driver. It seems that my VGA got some issues with drivers. Please help me and give me the solution to this problem. I have tried everything (like reinstalling window and format the hard-disk) but with no results. Thanks for your understanding and for your support. 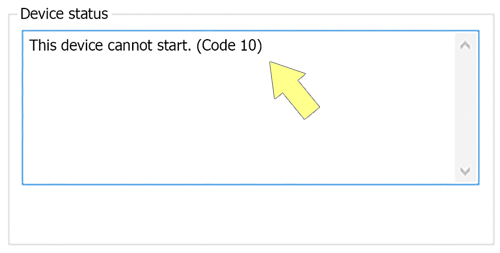 HI Rabin – when you say you are having trouble – are the settings accepted and then resetting or what error are you seeing? I have dell n5010 with ati mobility radeon and i have problem in adjusting the screen resolution and brightness even after i installed graphics driver. Plz anyone mention me the solution ASAP. sir , I have a problem and tell me its solution. I have a pc of lenovo, in which when I install Windows 7 then it gives a sound problem, mean sound drive gets install in it but even than the sound does not speak out, so what should be done with it. Hi Sunshine – has it ever worked on that PC or has the problem just started recently? If so, have you updated you OS or any other software or hardware? Have you tried the free drivers scan using the link in the article above? Installed a video card in my computer and know I am getting an error when I try and play sims 4. Can’t run the Sim’s 4 with the video card in this system please check that the video card meets the minimum specifications ad that the latest video drivers are installed. Hi Bonny – have you tried a video drivers scan (use download button) – is it showing problems with your video drivers? Upgraded to Win7 and IE11, at some point lost sound from videos. Current Adobe flash player is 15. Music files are ok. If I unplug the stereo speaker jack the sound will play for the video running at that time. Video ends no more sound. I will get an “decode error” message on video screen after unplugging. Reinstalling driver did not work. cornelious – have you checked ‘Sound, video and game controllers ‘ in Device Manager? Is there a yellow exclamation mark? I have problem in audio driver for every restart i need to install again. can u suggest me ? can you post details of your system and the problem/ no sound at all or intermittent/ low quality. Was it working before and have you updated your system since? My system is MB ASUSP5GD2/TVM/GB/SI, 3.00 G Hz P4 HT Processor, 4 X 1 GB DDR2 RAM. Operating system is Windows 7 32 bit. Problem is volume control in system tray is mute, message “No Out put device is connected”. No conflict (Yellow triangle with exclamatory symbol) in device manager. i have a hp 32 bit running on windows seven professional but with no audio. tried trouble shooting but doesn’t work even with external speakers,does anybody the problem? I have restarted my computer many times but nothing came off. What should I do? I have Server PC and i am using usb Sound card but when i opened device manager and opened playback tab i show just only one device that was speakers and in Recording tab there was a Microphone device so how can i set headphone device in these tabs and solve this problems. when my computers mother board was changed the inbuilt speakers have stopped working.do i need to install different driver? Mera computer me window 7 ultimate install hee osme mera sound driver nahi dal raha he mother wala or jisse me pehle sound install karta tha wo motherboard cd bhi toot gayi so please help me kese sound driver istall karo motherboard ka…..
how i know what audio driver we should install in our computer?